After a lot of internal debate, I recently decided I wanted to consult a registered dietitian to get a nutrition assessment. As some people close to me know, I have been working to get past some disordered behaviors surrounding food and exercise. I have managed to make a lot of great positive changes, but was starting to feel stuck in a routine around food and was getting worried about whether or not I was eating too much or not enough food still. I just needed a little guidance to make sure I was doing this right. I met with the RD last week and received my full nutrition assessment on Monday. Being the over-achiever I am, I was dead set on implementing the changes she recommended right away. That is not to say I am not completely freaked out about what additional changes are going to happen to my body. But I am trying to let go of my narcissism and trust that she knows best – she came highly recommended, works with athletes, people with eating disorders, and people trying to lose weight, she is well rounded and she knows her stuff. After reviewing my eating for over a week and talking thought my current activity level, she concluded that I still have not been getting the nutrients and energy I need and also has asked me to cut back on exercise even more. This should help boost my metabolism, keep me full throughout the day, improve my focus, my workouts, my energy, and balance my hormones. My new nutrition plan is not based on counting calories, but is based on getting the right combinations of nutrients through three meals, a pre-workout meal, and two snacks during the day. The goal is to get the right amount of carbohydrates, protein, fruit/vegetables, and healthy fats in each plate throughout the day. I was baffled by the amount that she wants me to eat, and by the amount of fat she wants me to include. But I have definitely enjoyed every bite I have had so far and already feel excited about all the new foods I am going to finally “let myself” eat (because she says it’s OK – which is all I really needed). The entire process is scary and I feel like I am eating way more than society tells me I “should”, but I am going to give this a try. 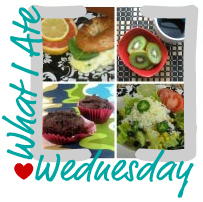 And what better way to share my experience than a What I Ate Wednesday post! Pre-Workout – I usually eat one homemade banana applesauce muffin, but based on my new plan, I need more. So I added a tbsp. of peanut butter and a banana. Workout – I did a 45 minute spin class followed by some easy stretching and abs. 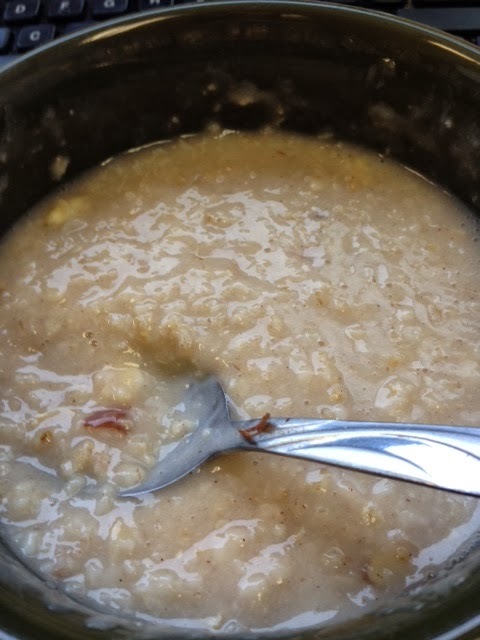 Breakfast – A packet of maple brown sugar oatmeal with almond milk, although my meal plan says I should also add some almonds or almond butter but I hadn't been to the store yet, so next time. Morning Snack – I have not had a snack between breakfast and lunch in YEARS, but I could feel myself getting a little hungry today around 11am, so I didn’t hold back. I had carrots and hummus with a hardboiled egg. Lunch – I felt really satisfied all morning, but was ready for lunch around 1:15. So I grabbed my usual turkey wrap with avocado and an apple. I will start adding on much more avocado to these – another request from my RD (she actually recommends a half of an entire avocado rather than the few slices I am used to - that could get expensive - ha). Afternoon Snack – I typically start to get really munchy around 3:00PM and have constant thoughts of food. But not today! I started to feel hunger around 4:15 so I had a whole wheat cinnamon raisin English muffin, half spread with almond butter and half with cream cheese. Plus a nectarine. SO GOOD, probably the highlight of my meals today. I think I am just a huge fan of nut butters - because that peanut butter this morning totally hit the spot as well. *Sidenote - it is really sad that I ate most of these meals at my office desk. It is 9pm and I have no munchies or snack cravings like I normally do. I haven't even thought of food. I think that means I ate enough, for once, throughout the day and the added fats are keeping me full! Fingers crossed this gets easier and easier, that my body responds well, and that I start to feel comfortable with this amount of food. For the first time in a while, I am really excited about food. All of the new treats and recipes my RD provided sound delicious and I can't wait to try them. Just trying to kick the negative thoughts to the curb and stay on track. Does anyone else eat this much or more food? Anyone else ever seen a dietician/nutritionist?